This past Monday, November 10, the Diálogo Intereclesial por la Paz de Colombia or Inter-Eclesial Dialogue for Peace (DIPAZ-Colombia) was constructed. The initiative comes out of a long path taken by Churches and faith based organizations walking together for two years to build an ecumenical body involved in the peace process of Colombia. The Churches and organizations involved in DIPAZ-Colombia include the Presbyterian Church of Colombia, the Lutheran Church of Colombia, The Mennonite Church of Colombia, Justapaz (a Mennonite organization focused on Justice, Reconciliation and Nonviolent Action), Mencoldes (a Mennonite foundation focused on development), the Inter-Ecclesial Commission for Justice and Peace, the Baptist University, the World Service department of the Lutheran World Federation, and the program of Faith, Economy, Ecology, and Society of the Latin American Council of Churches. The three areas of work decided on for DIPAZ-Colombia will be 1. Reconciliation 2. Non-violent Action and de-militarization 3. Truth and Justice. The group has decided to work for advocacy inside the churches, with the government, other social sectors and also directly with the peace process between the government and the FARC (Spanish acronym for the Revolutionary Armed Forces of Colombia) in Havana, Cuba. This work will be developed considering the following components; formation and pedagogy, media and communication, documentation, and specific processes of accompaniment. The Dialogue (DIPAZ-Colombia) is already planning a trip to Havana, Cuba this December to present themselves to those participating in the peace negotiations and share the proposals being developed by the group. The main focus will be to push for a confirmation that after successful negotiations there will be a Truth and Reconciliation Commission, to make sure the story of the conflict and the experiences of violence and rights violations do not go unaccounted by the civilian population that experienced it. The Human Rights Program of the Lutheran Church of Colombia is very happy to be involved in DIPAZ, as am I, especially at this stage of facilitating dialogue between different churches, all searching to fulfill a reconciling role for these times in Colombia. 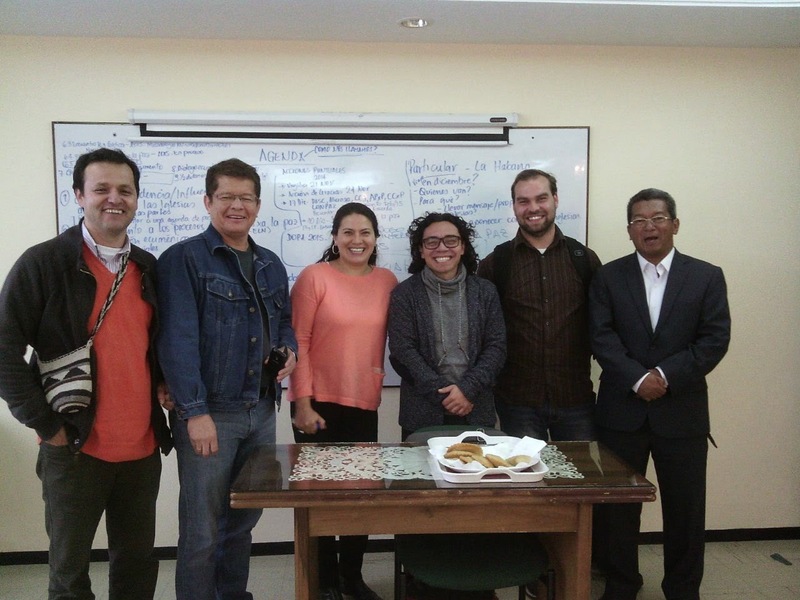 From left to right: Abilio Pena of the Inter-ecclesial Commission for Justice and Peace; Milton Mejia of the Latin American Council of Churches; Jenny Neme of Justapaz and the Mennonite Church of Colombia; Andres Alba of the Lutheran Church of Colombia; myself; and Luis Fernando San Miguel of the Presbytarian Church of Colombia; and the photo was taken by Beatriz Garcia del Foro of Lutheran World Federation. After this post was written, before being published the Colombian peace talks were suspended. The government decided to suspend the negotiations after the FARC guerillas captured and refused to release an army general, considering him as a prisoner of war. There has been no ceasefire agreement, meaning the peace negotiations have been conducted during the last two years while the conflict was ongoing. Please keep the people of Colombia in your prayers, as well as a return to the peace talks and its success.